Recipe: What’s the deal with breakfast bowls? Healthy habits may develop slowly, and it starts by planning out your meals. This is the one pictured most often in articles about breakfast bowls. It is also the option that requires a real investment — both financially and mentally. first of all, most bowls have a quinoa base. Cook the quinoa (rinse first), by placing 1/2 cup of the seeds in a pot with 1 1/2 cups of water and 1/2 cup of coconut or almond milk. Cook like you would rice, until the liquid is gone and the quinoa is fluffy. If you don’t want to do a quinoa base, try a chia seed and yogurt base. Top with superfoods like merjool dates, golden raisons, shredded coconut, goji berries, pepitas, sunflower seeds, flax, and more chia seeds. Add nutmeg and cinnamon, as well as berries or nuts to your liking. This one seems like a waste of a bowl to me. Essentially, you make a smoothie and then put it in a bowl and top it off with superfoods and fruit — chia seeds, coconut, and berries for example. You then proceed to eat the smoothie with a spoon. Personally, I make a smoothie for breakfast only when I’m on the run. I can put all these good things IN the blender (chia seeds, berries, granola, flax, ect.) and drink it on the bus. Why on earth would I want to make it into a bowl? I think the answer is obvious: for the Instagram likes. Am I right? Sometimes breakfasts can be a bit too sweet. Try making a quinoa base and topping it with nuts, hardboiled or poached eggs, some sausage, and avocado. Not feeling like the extra carbohydrates? Try exchanging the quinoa base for greens like kale or spinach for a breakfast salad-type of thing. Top with sprouts, sweet potatoes, or other light-vegetables that are easy on the stomach. Add some nuts for extra protein and a light homemade dressing with lemon juice, oil, and spices. Want to satisfy a sweet craving? Try making a chocolate chia pudding and topping it with fruit. This pudding can be quite filling, so half a cup is plenty. In a bowl, whisk together one to two cups of milk (or almond milk) , 1/4 cup chia seeds, 1/4 cup cocoa, a sweetening agent (I use agave or maple syrup), and some vanilla. Refrigerate overnight in the bowl or divide into jam jars for portability. You may have to experiment with the ratio of chia seeds and milk until you reach a consistency you like. Top with fresh strawberries, bananas, or blueberries. Or go crazy and choose all three! While these “bowls” are picturesque, I’m not sure if they are worth the time (and money) it would take to make them. I’m more then happy with my regular smoothies and granola-yogurt combinations — which by the way, is the exact same thing as these “bowls”, but without the expensive superfoods. Have you made a breakfast bowl before? Let us know what you put in it in the comments below! It’s been a week and you’ve probably finished the leftover turkey, stuffing, and beans — but what do you do with that leftover pumpkin you have in your fridge or freezer? This article is for those of you who use real pumpkin in your pumpkin pie — a dying breed, I know, but I respect your dedication to tradition. I myself use real pumpkin, mostly because if I don’t I think it would disappoint my mother. A small cooked pie pumpkin usually yields enough pumpkin to make two pies. However, if you are like me and really don’t require two pies for Thanksgiving dinner, that means you have about two cups of pre-cooked filling to use up. The good news is that it’s still October, which means that pumpkin goods are still wildly popular. Here are a few ideas for those of you with some puree pumpkin leftover from your Thanksgiving cooking. Puree the pumpkin until it’s the consistency of a sauce and then pour it in a pot. Heat it up with some cream or milk, garlic, Parmesan cheese, vinegar, and some spices to taste. If you want a more cheese-based sauce, try adding some cream cheese. This will create a creamy, but sweet, sauce that will rival any white sauce you’ve had to date. If you aren’t a fan of creamy sauces, try adding chunks of pumpkin to your pasta dish. Pumpkin compliments seafood, but it will taste good with about anything. My favourite is to mix it with sausage, tomatoes, and coriander with a light oil-based dressing. It’s a simple way to make your pasta dishes warm and festive. Because the pumpkin is already cooked, it’s safe to use it in cold dishes, which is great because it tastes delicious in breakfasts. If you love smoothies, try blending some pumpkin puree, a banana, some milk (soy or 1 %), cinnamon, and a sweetening agent like maple syrup. Add some ice cubes to cool the drink. It’ll be like drinking pumpkin pie, but slightly healthier. If you don’t like blended foods, try overnight oats — they are just as easy to make as a smoothie, except you have to do it the night before. In a jar, put a quarter of a cup of oats with half a cup of milk (or coconut milk), a bit of puree pumpkin, some chia seeds, cinnamon, and of course a sweetening agent. Add fruit or nuts if desired. Shake up the jar (with the lid on) until everything is mixed together and place in the fridge overnight. You can eat this cold or heat it up at work. I love pumpkin muffins and scones — but store-bought baked goods can sometimes be way too sweet and full of preservatives. Try making them at home! There are hundreds of recipes online, but before you get too overwhelmed, remember this golden rule. For muffin, you are simply replacing milk with pumpkin as a liquid ingredient. Sure, there will be a few extra spices to add and nuts to sprinkle on top if desired, but the recipe itself is as simple as making blueberry muffins. Scones are a bit more challenging, but it’s only because you are handling a specific type of dough. However, in essence, a pumpkin scone is just a regular scone…with pumpkin and pumpkin pie spices. Make sure to create an icing to drizzle on top of it. Remember: don’t douse it like they do at other coffee shops. Have fun with some designs or simply create a few lines on top of your baked good. Do you have a favourite pumpkin recipe? Post it in the comments below! Summer is here! 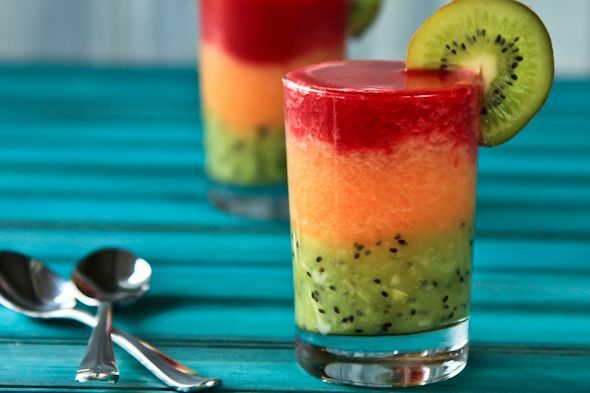 With the warm weather tickling our fancy for a cold, summer drink, we couldn’t resist putting together these smoothie recipes for you to try. The colours will excite you, the taste will please you, and the satisfaction will complete you. What are you waiting for? 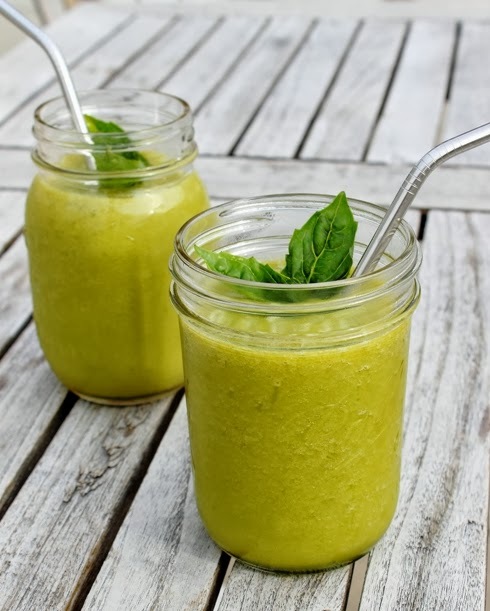 Grab your blender and try out these 5 smoothie recipes now! 1 lemon peeled, sliced and seeded. Directions: Place all ingredients in a blender and secure lid. Turn machine on and quickly increase speed to high. Blend for 90 seconds. Garnish with fresh basil leaf or lemon wedge. Directions: Stew peaches by cutting them into pieces and placing them in a saucepan with a few tablespoons of water. Bring to a boil then simmer. Mash them against the side of the pan to release juices. Simmer about 6 minutes. Let the peaches chill in the fridge. Blend all ingredients together. Sweeten to taste if needed. Garnish with mint and frozen blueberries. Directions: Blend all ingredients together. Sweeten to taste if needed. Garnish with mango chunks and one slice of pineapple. If you’re up for a challenge or have some extra time (and fruits) laying around, try this layered smoothie to leave a lasting impression on your friends- and their tummies! 1. In the basin of a food processor or blender, combine raspberries and honey. Pulse or blend until pureed. Strain raspberry puree through a fine mesh sieve and discard seeds. Mix in lemon-lime sparkling water and set aside. 2. Combine the peeled kiwi and lime juice in the clean basin of a food processor or blender. Pulse or blend until pureed. Set aside. 3. Add the cantaloupe in the clean basin of a food processor or blender. Pulse or blend until pureed. Set aside. 4. To layer your drink, gently spoon equal amounts of kiwi puree into each of four bowls or glasses. Repeat with cantaloupe puree and raspberry puree. Garnish with kiwi slices.